A letter from Amnesty International which entails information including the definition of a refugee. This particular website focuses on the process of how information is used in order to create laws. 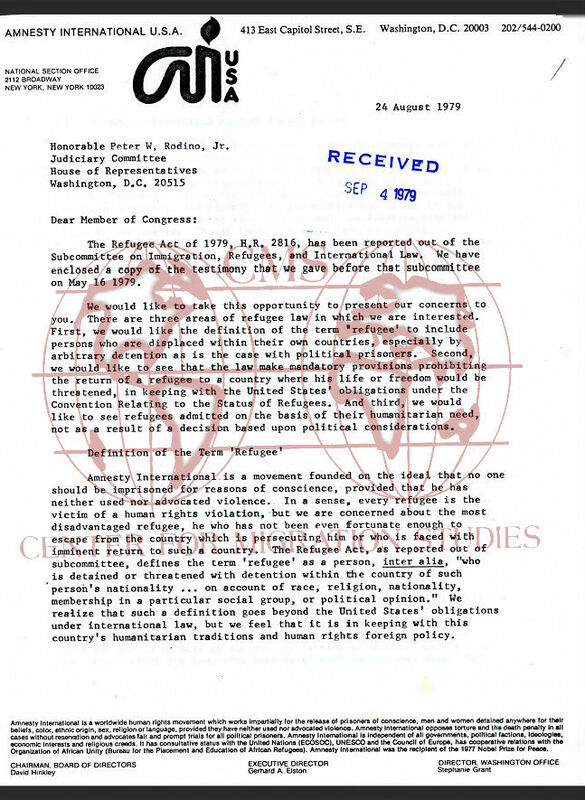 To show how this process is done, this website uses various documents obtained from the Endres Collection at the Center for Migration Studies which all pertain to the creation of a very important piece of legislation, The Refugee Act of 1980. While the documents contained in the thirteen boxes at the Center for Migration Studies were created in the 1970’s and 1980’s, the overall enactment of the laws remains relevant, which ultimately allow these documents to serve as a concrete example of the present legislative process. While there are quite a number of ways to get involved in the lawmaking process, one way that individuals and organizations interjected themselves in the procedure was to directly contact a Congressional representative. Pictured left is a letter from Amnesty International, a nonprofit organization in favor of human rights, to House Judiciary Committee chairman Peter W. Rodino, Jr. This letter explains many of the concerns of Amnesty International such as what exactly being a refugee entailed, what would happen to the refugees if they faced a forced return back home, and a refugee’s overall priority status. This letter allows viewers to see how individuals can directly connect with the lawmaking process as well as how everyday citizens can exhibit their fundamental freedoms of life, liberty, and the pursuit of happiness by directly contacting those who have the power to change, alter, and create new laws. This entry was posted in Center for Migration Studies (NY), Exhibits and tagged Endres Collection, Legislative Process, Refugee Act of 1980. Bookmark the permalink.